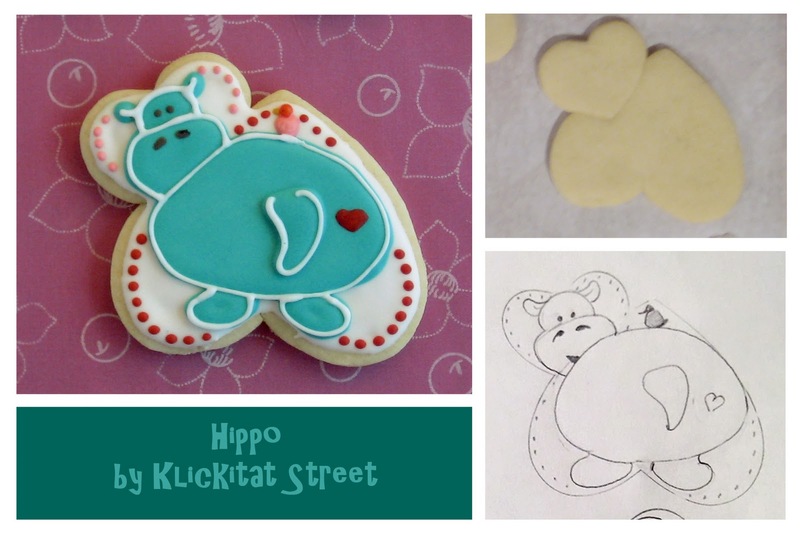 Continuing on from yesterday's post I have some more Valentine's Day animal cookies for you! 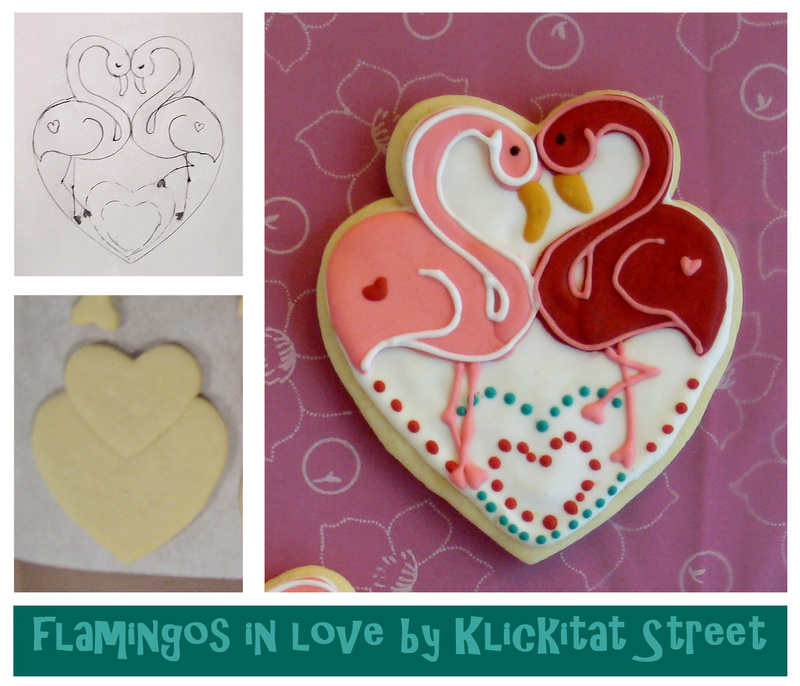 Like last time, all these cookies were cut using only heart shaped cookie cutters and then pieced together before baking. Be sure to visit part 1 for a few tips on piecing the cut dough together. I think this zebra is my favorite from the entire set! He would have stood out better if I had put him on a pink background but I love him anyway. 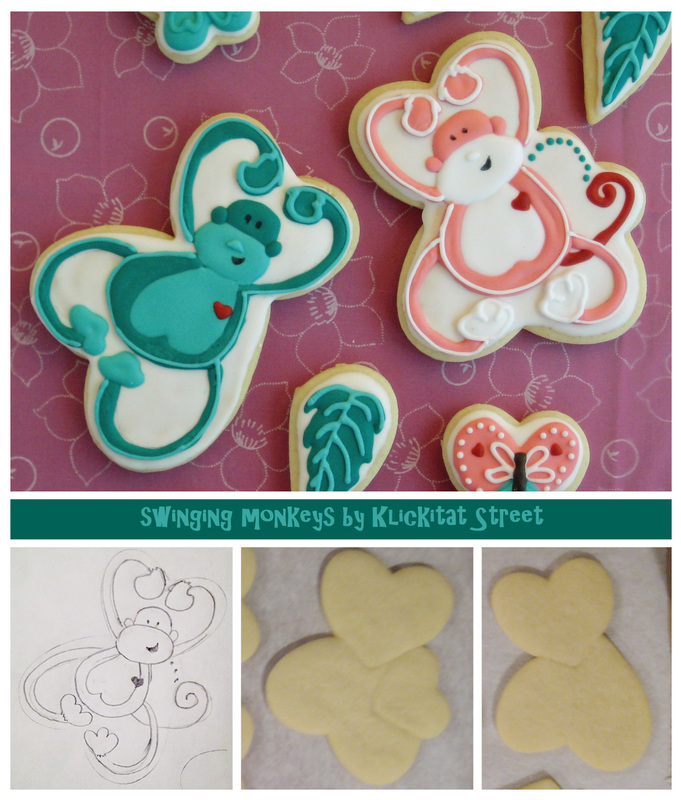 I tried two different shapes for these swinging monkey cookies. 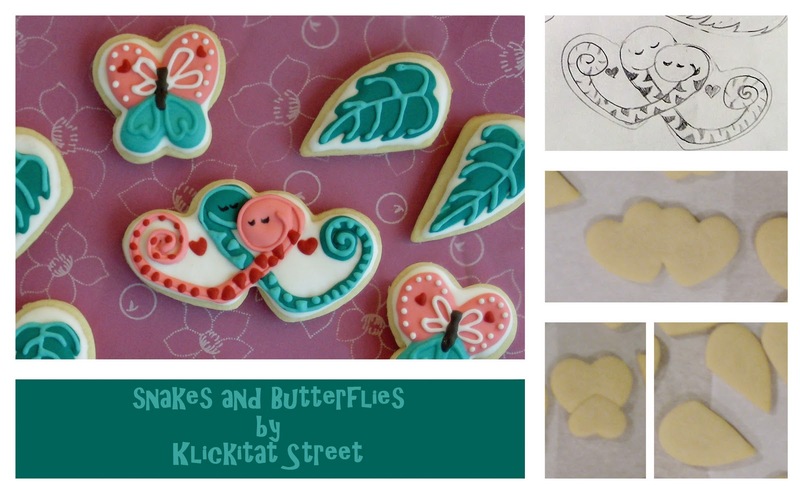 The teal monkey is pieced from 2 heart cutters and the pink one was made with a third smaller heart to make a space for the tail. 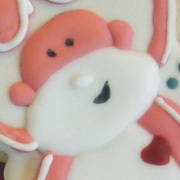 The "all-hearts" design is is more obvious in the teal monkey but I think the pink monkey is cuter! Plus, the pink monkey is probably a stronger cookie since the third heart makes it thicker where all the pieces come together. This snake cookie was made from a double heart cutter but you could join two small hearts together. And that's the last of them! 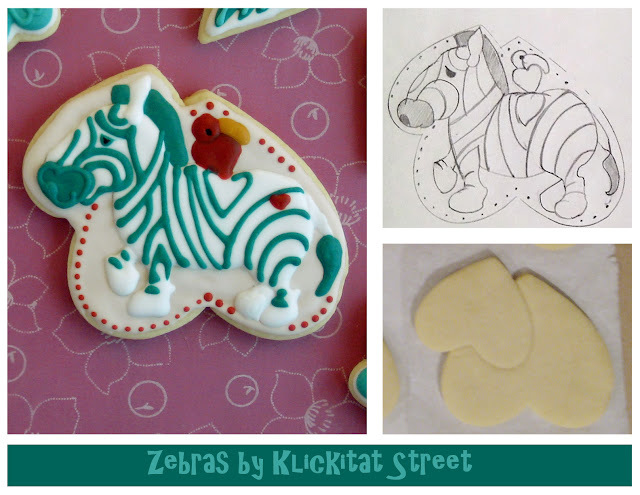 Looking at this post of course I realize I need a giraffe...and an elephant...and a toucan! There's always next time, right?! I hope you enjoyed these guys. I know I did. If you happen to make some cookies like this I'd love to see them. You can share them on my Facebook wall! Before making this set of cookies I hadn't worked very much with piecing cookie shapes together before I baked them. But now I have! There's actually nothing to it and you get so many more things to do with your cutters! My projects tend to grow out of my control and get much bigger than I had planned. 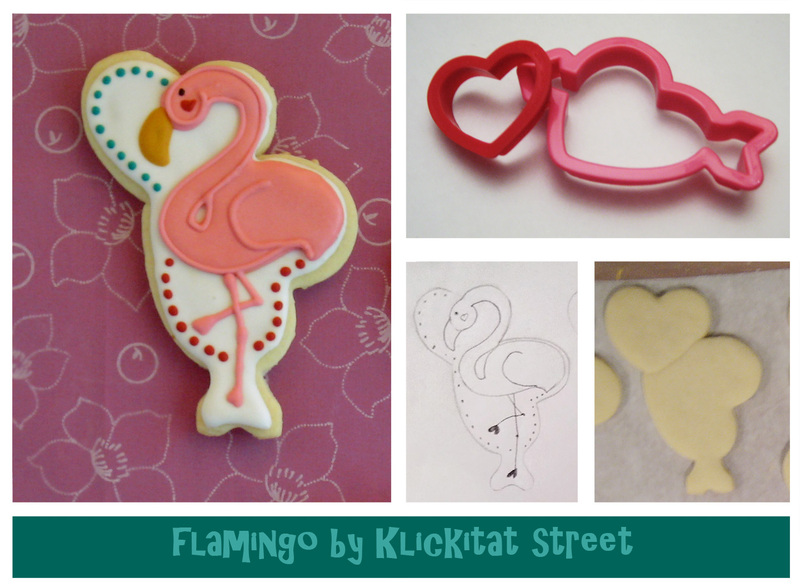 In truth I just wanted to make pink flamingos and didn't have a flamingo cutter. Story of my life. I don't know how all these other guys got here. They just sort of came stampeding in when I opened the door. 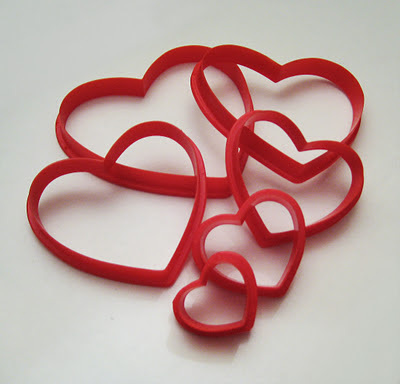 The good thing about Valentine's Day, for making cookies anyway, is that you only need one cookie cutter shape. 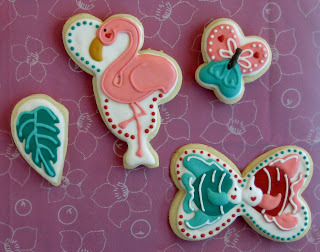 This is a nice little set from Wilton of nesting hearts and I used them to make all my jungle cookies! Okay right off, that's a lie. 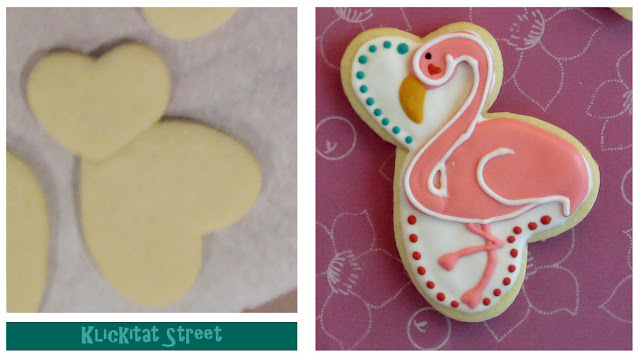 I used another cutter for the flamingo too. I liked how this heart-and-arrow cutter give a little place for her feet. You could use just the nesting heart cutters though, so it still counts! 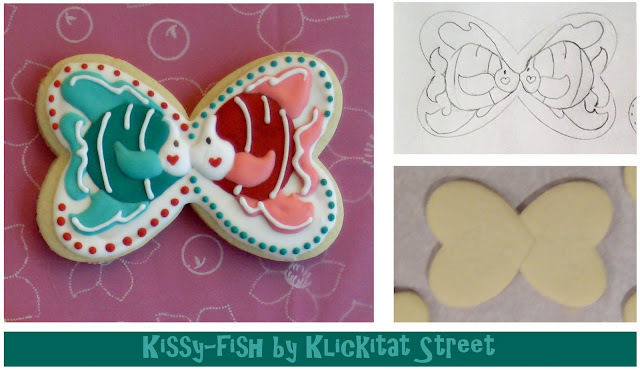 And kissy fishes! - These are probably the most fragile of the group because the join between the pieces is such a small area. 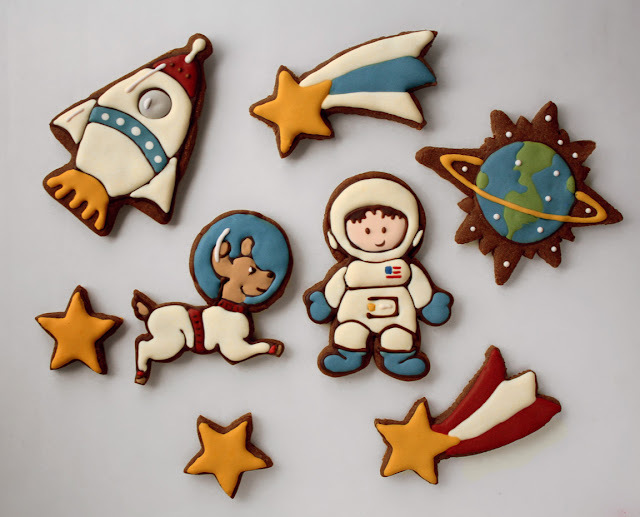 I made sure to let them cool before I handled them so I didn't have any problems with breakage, but using them as cookie favors or the like would probably not work. Look how cute they are though! Cut the dough shapes separately. 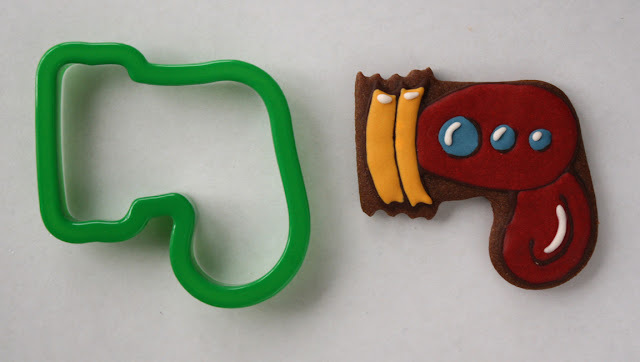 Then cut one shape out of the other and piece them together. 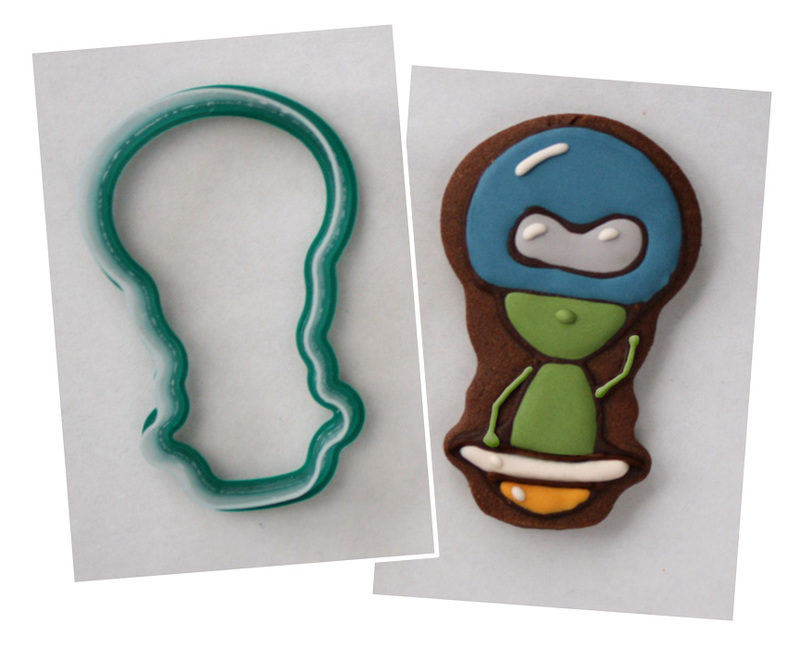 Let your cookies cool completely before moving them around. They're very soft and tender when they are warm. A dough that spreads a little is probably a good thing here so the pieces will join more as they bake. All those tips you learned to stop cookie spread, yeah forget that. There is more to come! Stay tuned. 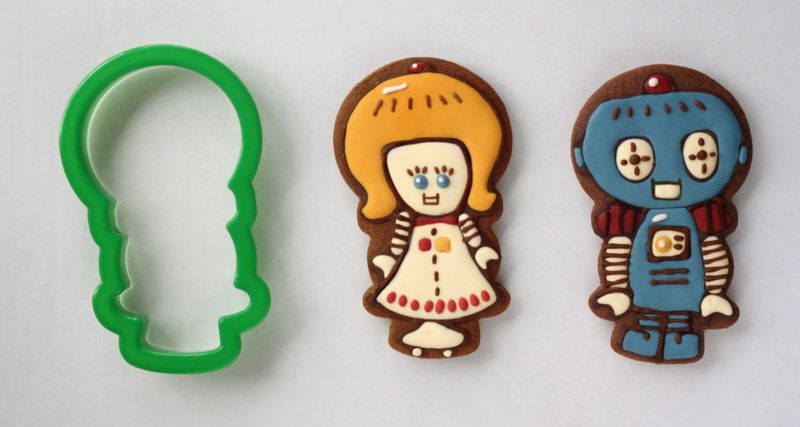 A little while ago I was looking at a snowman cutter upside down and saw a bunch of little girls in it. Of course I had to go on a hunt and check all my snowmen. 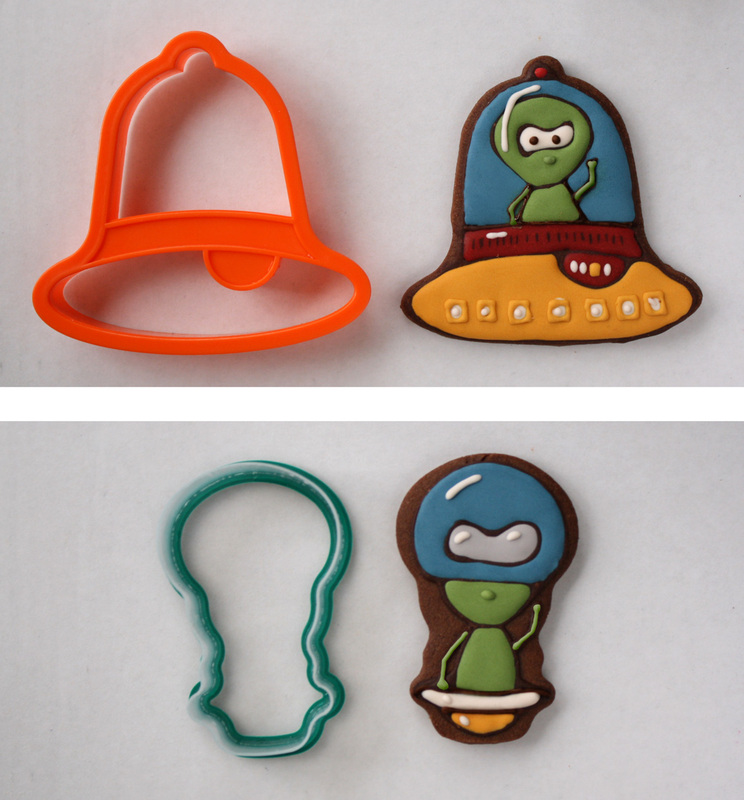 Now this little fellow here could become a little girl in a pinch (maybe if she were wearing a large hat) but clearly he's an alien riding around in a little ship. 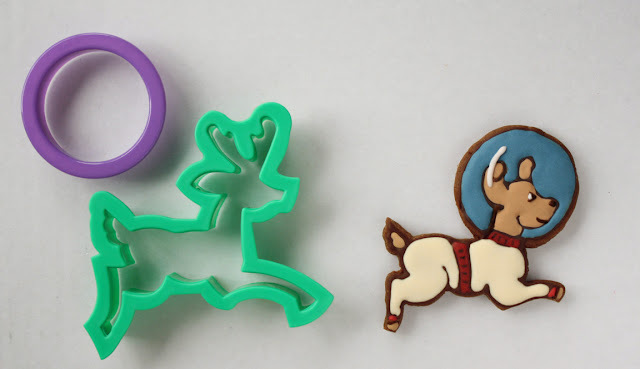 I didn't get to make too many cookies at Christmas plus I bought cutters at after Christmas sales and what, I'm going to wait a whole year to use them? I don't think so. I had to make a whole space set to go with my little alien. 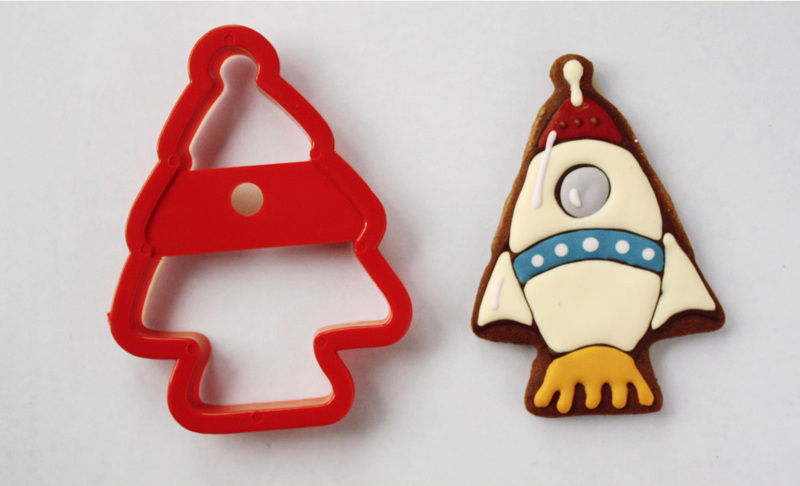 You wouldn't have to use just Christmas cutters of course, but they turned out to be the best choices anyway! There are a lot of colors and other things going on here so I tried to make it all as simple as it could be. I made only one piping icing in dark brown to do all the outlining and then flooded with the colors. I made the colors a bit "retro" by adding a small amount of copper food coloring to each color. It worked really well in muting the colors. I had so much fun with this set, I hope you like them too!